I recently published an article that explored some of the ways regulations make it difficult for small businesses to get off the ground and function. Among the examples I used from around the country was Bank Suey in Hamtramck, Michigan. My story was subsequently reposted on various other sites which the owner, Alissa Shelton, read and objected to. She felt I hadn’t accurately described her experience as a business owner and that I didn’t present her town in the right light. Her critique can be found in the comments section of the old post. She’s a smart, dynamic, capable young woman who’s committed to building up her community and I owe it to her to get this right. We need more people like her in all our towns. I’ve also had people write stories about me where they got the details wrong, so I understand her position. But I honestly don’t think we’re disagreeing. It’s more a matter of subtle interpretations viewed from slightly different perspectives. I’ll start by saying that I enjoyed my time in Hamtramck and would be happy to live there. I’ve highlighted the town before on a couple of occasions, always as an example of a place that worked really well in the past and has all the right ingredients to continue to thrive. 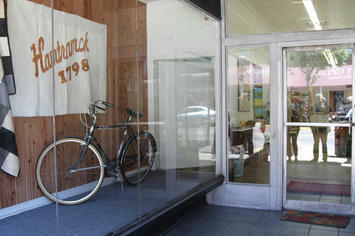 Hamtramck’s Polish history is still well in evidence. Polish food, Catholic services, and cultural events persist, although in somewhat reduced form. Poles have largely dispersed over multiple generations and filtered out across the country by now. The void left behind by departing Poles has been filled by new immigrants from Somalia, Iraq, Pakistan, and Bangladesh. Without them many more storefronts and homes would be vacant and in decline. One of the things I love about Hamtramck is the availability of good quality food and groceries that aren’t always available at national chain stores. The fact that ethnic mom and pop shops exist within walking distance of most families is very appealing and is reminiscent of my own neighborhood in San Francisco. And as Ms. Shelton states with some pride, it’s possible to eat at a different restaurant every day of the month in Hamtramck and enjoy every kind of cuisine from Lebanese to Chinese to Italian. So… Now that I’ve clarified my position and reinforced my appreciation of Hamtramck as a pleasant and viable town I can get on with the finer points of regulation as it relates to small scale situations – which was the primary subject of my older post. Ever since World War II all our national economic policies have heavily favored and seriously subsidized a particular kind of growth involving mergers and acquisitions, vertical integration, and ever larger economies of scale. The demise of mom and pop shops in our traditional downtowns was a consequence of this intentional long term economic strategy. And it worked perfectly for those enterprises that could effectively scale up and take advantage of the tax code and institutional financing. I’ve described what this does to our towns in previous posts here, a href="https://granolashotgun.com/2016/07/07/your-town-is-a-financial-time-bomb/">here and here. The relatively small local supermarket chains of the 1960s were replaced by larger regional chains by the 1980s and then by even larger national big box stores by the 1990s. Today we’re seeing a rapid shift toward even more consolidation with on-demand shopping via the interwebs. Giant distribution systems eliminate physical retail altogether in favor of home delivery. So we now have a trail of tears as more and more redundant commercial properties rot – not just downtown, but all up and down our suburban arterials. This isn’t simply a result of consumer preferences or entrepreneurial best practices. The transfer of wealth from small family operators to huge consolidated multinationals is a structural choice we as a society have made. It’s great if you want really cheap cases of toilet paper and increased shareholder value. But our traditional towns have been hollowed out as a direct consequence – and the suburbs are next. One of the few niche markets to persist on Main Street are places that sell specialty items like traditional Polish pierogi or halal meat which are unlikely to be carried at the Dollar Tree or 99¢ Store. But there are only so many of these places to fill the void. So when Ms. Shelton says local regulations aren’t preventing her from opening a new retail enterprise in her building she’s right, but only if national tax and investment frameworks are ignored. You can listen to an interview with Catherine Fitts for one interpretation of the macro situation. Hamtramck is working passionately to fill empty storefronts with anything that will activate the space and keep the lights on. Art installations, community groups… That’s all well and good. But there’s a limit to what this approach can provide. It’s a necessary stop gap, but toward what? Which takes me back to local regulations. These old retail buildings are zoned for commercial use. Market demand for commercial property is essentially zero and the corresponding property value is in keeping with that reality. There’s just too much of it everywhere and the situation is likely to get worse nationwide. The obvious parallel is the glut of warehouse and industrial space that emerged when a previous generation of commercial buildings were abandoned during the national transition away from manufacturing. The best case scenario for these places is that they get used for something other than retail or office space. This takes me back to scale and the larger regulatory framework. If a large production builder arrived in town and announced plans to redevelop a chunk of Hamtramck as a lifestyle center with new condos and apartments, would the rules be different for them? A 200 unit complex with five stories of structured parking would be “transformational” and “catalytic.” Institutional money would be combined with pro-business government incentives and tax breaks. That’s my point. This piece first appeared on Granola Shotgun. John Sanphillippo lives in San Francisco and blogs about urbanism, adaptation, and resilience at granolashotgun.com. He's a member of the Congress for New Urbanism, films videos for faircompanies.com, and is a regular contributor to Strongtowns.org. He earns his living by buying, renovating, and renting undervalued properties in places that have good long term prospects. He is a graduate of Rutgers University.